Mace Windu is a defensive Jedi tank with the ability to remove enemy buffs. We will be giving you a brief guide on what this character has to offer your team. Basic Ability: Invincible Assault – Deal Physical damage to target enemy with a 45% chance to gain Defense Up for 2 turns. This attack deals 75% more damage if Mace Windu is affected by Defense Up. 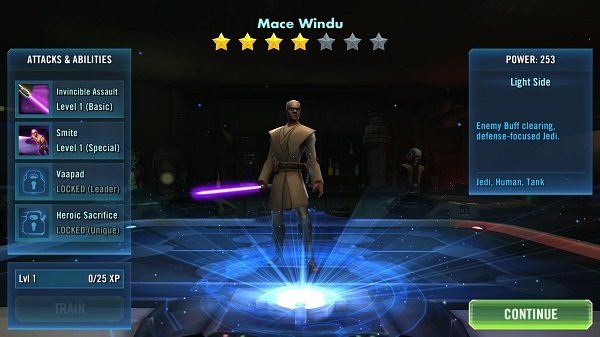 Unique Ability: Heroic Sacrifice – Each ally gains 30% Turn Meter the first time Mace Windu is reduced to 50% Health, 85% Turn Meter the first time Mace Windu is defeated. Leadership Skill: Vapaad – Jedi Allies gain 20% Offense and 9% Critical Chance. Mace Windu is a very good leader, especially or an offensive Jedi team. Outside of his leadership skill, he can remove enemy positive effects. This is very useful against strong units that deal a lot of damage. His self defense buff is useful in making him tankier. As his health drops below 50%, your team gets a bonus boost to turn meter, allowing them to move again quickly, giving you a slight advantage. I would prefer him to have a taunt to make him even stronger, but that is not the case. Well he is strong, the key weakness about him is his speed. At 103, he is below average in terms of when he gets to move in battles. Most of the time, if he isn’t focused, his unique ability doesn’t trigger and therefore not giving you any advantages. When he is dead, he will give your remaining team members a turn advantage, but that is about it. If you can, make a Jedi team of him, Jedi Anakin, Barriss Offee, Obi-wan, Luminara Unduli and Ima-Gun Di, you can deal some serious damage. Will be reviewing him soon! I just faced him and he apparently now he has an attack which exposes and destroys you in one turn. Looks like this site died slowly over the last two weeks. Are you having trouble loading the site? No, Site is stagnant, and there’s many updates added into game recently, more still coming soon. Level info of shatterpoint skill please! !